Chancellor Carmen Farina Continues The DOE's Education On The Cheap Policy. Chancellor Carmen Farina has informed principals that there will be no increased funding to their tight budgets for the next school year as she continues the Bloomberg Era funding that has seen the average school budget reduced by 14% since 2008. The Chancellor's decision not to increase school budgets is very disappointing in light of the City's improved economy and the additional education funds coming from New York State. The City has reported over a $4 billion dollar budget surplus for this and next year while the State has earmarked an additional $730 million dollars for education the next school year. Unfortunately, the Chancellor has decided that none of the extra education funding will go to the classroom. Instead the Chancellor claims the money will go for pre-kindergarten, arts, and after school programs. Principals were hoping that the extra funding would go to the schools to reduce class sizes, add teachers and other staff, or to provide extra programs but the Chancellor's decision means its business as usual at the DOE. 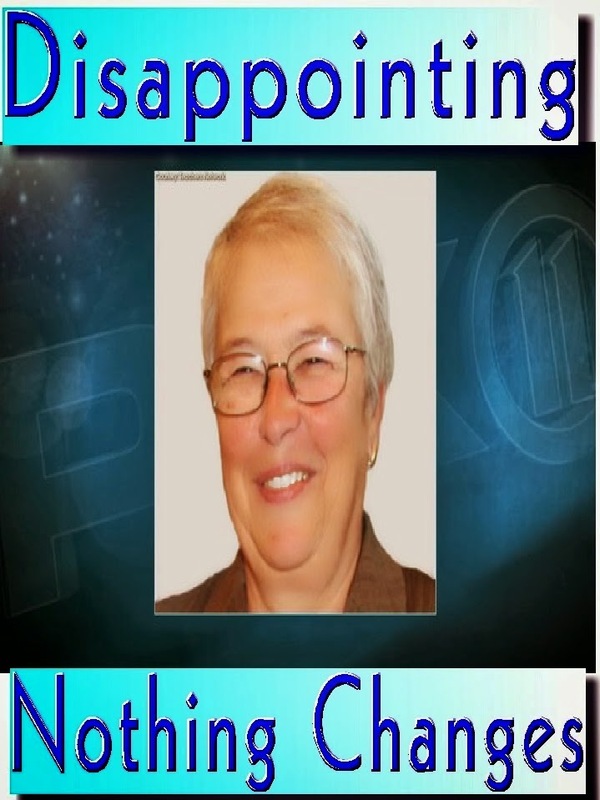 The failure of Cahancellor Carmen Farina to increase school budgets can be directly traced to her refusal to "clean house" at the DOE, the continuation of the useless and money-sucking Children First Networks, and her continued use of the badly flawed and biased "fair student funding" program that forces principals to hire the"cheapest" and not the "best teachers" for their students. Chancellor Carmen Farina has been a major disappointment for not giving the schools a much needed increase in their tight budgets and her failure to reduce the bloated DOE bureaucracy. The result is the continuation of the Bloomberg Era's "education on the cheap" policies that has resulted in flat student academic achievement and an ever widening racial/income academic achievement gap. Demystifying The Annuity Savings Accumulation Fund. One of the nice perks that New York City teachers get is the Annuity Savings Accumulation Fund, known as the ASAF. However, its also a fund that most teachers don't know they have and how it operates. The ASAF is created for each teacher that has completed step 8b of the salary scale. Every year the DOE gives $400 to the teacher's ASAF and the City chips in by crediting the total account balance with an annual interest rate of 5%. For example, let's take a hypothetical teacher who is scheduled to retire after thirty years of teaching. Assume that the teacher started at salary step 1A of the teachers salary scale and completed 8b after eight years. That means that for the last twenty two years of employment, the teacher received $400 from the DOE for a total of $8,800. However, when you include the City's 5% interest rate contribution, the total ASAF account balance is nearly doubled to $16,200! The good news about the ASAF doesn't stop there either. Once the hypothetical thirty year teacher retires, the ASAF account balance is annuitized and depending on the age of the teacher when he or she retires, the teacher will get between $1,300 to a bit over $2,000 annual pension supplement for as long as the teacher lives. This pension supplement will be included as part of the pension check. Of course the numbers will be different for different lengths of employment. The table below shows the different age-based correction factor used to determine the annual ASAF pension supplement for the hypothetical thirty year teacher used in this post. Hopefully, this post has demystified the puzzling ASAF and shows its importance in providing extra pension income in retirement. As Mr Spock states "Live long and prosper" and the ASAF is a significant part of making that happen. This is the first article about how our retirement and pension system works and I hope this is informative to all who are fortunate enough to retire with a nice chunk of money. 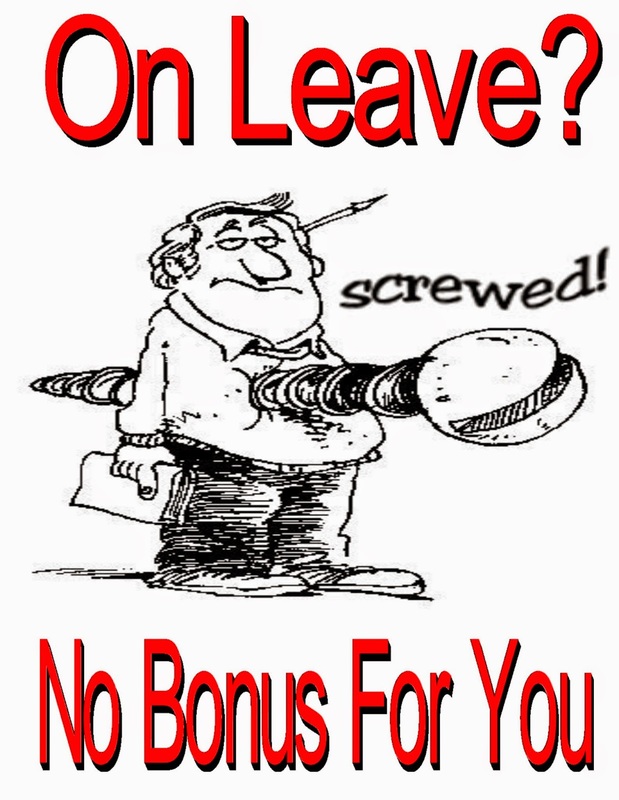 The Union Screws Members On Unpaid Leave By Excluding Them From The $1,000 Bonus. Yes, its true. Chalkbeat has reported that our union has screwed another group of its members by excluding the people who are on unpaid leave from receiving their $1,000 bonus.That;s right 3,600 UFT members will not be receiving their $1,000 bribe bonus since they're not considered active members. These members on unpaid leave now join those who have resigned or were terminated, ATRs, discontinued teachers, and those members who die before the end of the contract as being screwed of their hard earned money and "due process rights" by a union that seems to have different rules for different groups of their members. What ever happened to union solidarity? Interestingly, history has shown that this is the time when many female teachers take their six week unpaid maternity leave as they have the summer off to take care and bond with their baby before having to go back to work in September. Therefore, quite a few of the teachers on unpaid.leave are having babies and are being screwed out of the $1,000 bonus at the very time they need the money the most. The eliminating of the 3,600 UFT members who are on unpaid leave from the $1,000 bonus will save the City 3.6 million dollars. This is yet another example of the union not being honest about the various issues pertaining to the proposed contrct. What's next? that we will be paying for our Health benefits after all? First, a little history. The new Chancellor, Carmen Farina, was a very important part of the Joel Klein's inner circle as a Deputy Chancellor and only retired when she saw much of her authority taken away and given to a subordinate, Eric Nadelstern. Encouraged to come out of retirement to be the new Chancellor for Mayor Bill de Blasio, she has been a vast disappointment and even suffering a Cathie Black moment by failing to close schools during a blizzard and then while it was sleeting with freezing rain by saying "its a beautiful day". Rather than do what should have been a no-brainer and "clean house" at the DOE, Carmen Farina has instead promoted some long-term Bloonberg bureaucrats into the highest positions as Deputy Chancellors. Katherine Grimm and Dorita Gibson. Moreover, her failure to remove some Superintendents and the continuation of the useless and money-sucking "Children First Networks" says everything about her failure to change the tone at the DOE. Moreover, Carmen Farina's past and present actions suggests she is pro principal but not pro teacher. As Principal she had a 80% teacher turnover rate which strongly suggests that she didn't collaborate well with her teaching staff. Furthermore, stories about her actions from Betsy Combier and Phillip Nobile's comment show that she has made some very questionable decisions over the years. During the contract negotiations, the Chancellor's position was to have all the ATRs fired by giving them only four months to find a position. With her approval for the continuation of the "fair student funding" any time limit is simply a termination program for senior teachers and she knows that, According to one blogger, South Bronx schools, Ms. Farina claimed only 400 of the 1,200 ATRs are capable teachers. I guess to the Chancellor these are the teachers that never received an unsatisfactory observation or went through a 3020-a hearing. More importantly, she has convinced the union to have a "caste system" and have the lowest caste being those teachers who won their 3020-a hearings who are known as the "untouchables". Finally, the chancellor has retained the teacher termination requirements under the teacher evaluation system that makes it very difficult for teachers to win their case if given two consecutive "ineffective ratings". When compared to the Chancellor's of the Bloomberg Era, she may cooperate with the union leadership but when it comes to the classroom teachers she still practicing many of the destructive Bloomberg Era policies and its still "education on the cheap" under her tenure. Chancellor Carmen Farina is still part of the problem and not a solution. 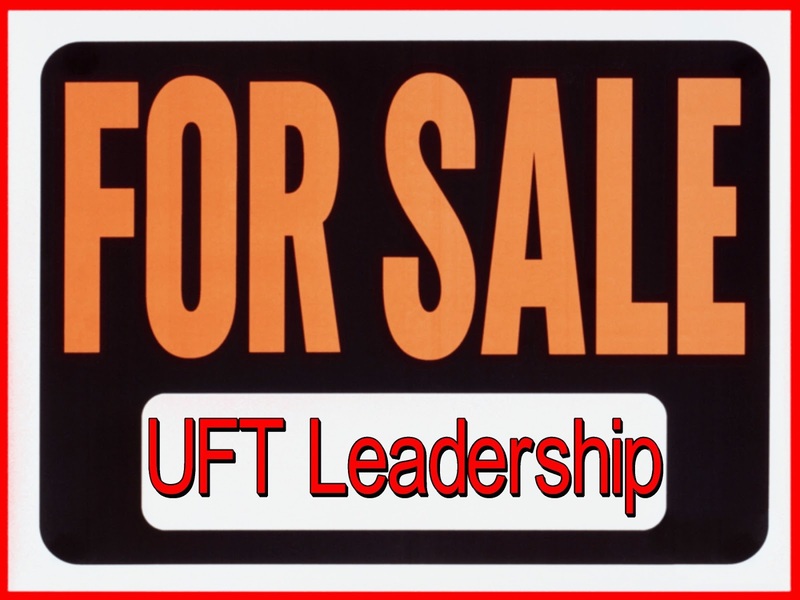 The UFT Leadership Sold Out The Members To Support Mayor Bill de Blasio's Progressive Agenda. Let me first make this perfectly clear. I have no problem with Mayor Bill de Blasio's progressive vision for New York City. Many of his ideas are preferable to Michael Bloomberg's view that closed schools and benefited the 1%. I believe he is pro education and doesn't demonize teachers like Michael Bloomberg did. However, I don't like the fact that our union, the UFT, sold out the members to help the new Mayor with his agenda. What did the union leadership do that sold out the members? Let me count the ways. First, the union leadership agreed to defer the two 2009-10 4% raises until October of 2015 and not get the last part until October of 2018. I don't mind the retroactivity being deferred but the raises themselves? The union should have negotiated a 10% wage increase for September 2014 Instead we are getting a paltry 2% raise and a $1,000 bribe to sign the contract in October 2014. Moreover, the union leadership agreed to eighteen months of "0" raises and that's unacceptable to all the Municipal unions and should be to us. Second, the lump sum retroactive pay was even deferred further into the future with the bulk being paid from October 2018-20. Interestingly, we do not receive any lump sum retroactive pay in October 2016 that further helps the City to fund other programs. Third, The union leadership has agreed not to demand the interest built up in the almost five years that the union did not get their two 4% raises as was done in previous contracts. Moreover, according to a math teacher, the retroactivity calculated is based upon the end of a calender year rather than the end of the previous contract and there is as much as a $5,000 difference between what the City owes us and what the union claims we are getting by October 2020. Fourth, any teachers that resigns, are terminated, or die before retiring will not receive their retroactive raises or lump sum payments. This is just like an annuity where the City and union is hoping something happens to the teacher before he or she can collect the money. Already, discontinued teachers won't receive any retroactive pay even if they worked in the 2009-10 period to the second semester of the 2012-13 school year. Fifth, the disgusting targeting of the ATRs by diminishing their "due process rights" and offering them an inferior severance package. This new teacher "caste system" is simply a ploy by the City to terminate as many ATRs as possible abd save money. Moreover, to allow the DOE to punish ATRs who won their 3020-a termination hearings is a moral failure on the union's part. Finally, the union's failure to change the termination procedures in the teacher's evaluation system is proof that the union leadership is not interested in protecting teacher "due process rights" as they so claimed. Obviously, to make the new Mayor look good and support the " its a beautiful day" Chancellor, the union leadership sold out the members and that's a crime. In The DOE Its Ideology First And Children Last. It has been about six months since the NYC public schools have had a new Mayor and a long term educator as Chancellor. However, when it comes to real changes to the damaging Bloomberg education policies, nothing has changed. For example, the DOE continued to fight "tooth and nail" to require teachers to submit a detailed and formatted lesson plan as part of the teacher's classroom observation. Even after an Arbitrator upheld the UFT grievance that stopped the DOE from having administrators require such lesson plans, the DOE failed to inform school administrators that they could not require specifically formatted lesson plans. Furthermore, the DOE, in negotiations with the UFT for the new proposed contract demanded a four month time limit on excessed teachers who were not offered a position. The DOE knew very well that with their existing policies in place that any ATR time limit was simply a termination program. However, the DOE's Bloomberg ideology did score a win as they did get the UFT to agree to a teacher "caste system" with diminished "due process rights" for ATRs. It still seems to me that the DOE is still going after teachers with the same vigor as they were during the Bloomberg years. Under the Chancellor many of the worst policies of the Bloomberg Era has been retained. First, and foremost is the "fair student funding". Second, the termination process for teachers found "ineffective". Third, the continuation of large class sizes, and finally, the widespread use of teachers not certified in the subject they're teaching in with the union's approval I might add. 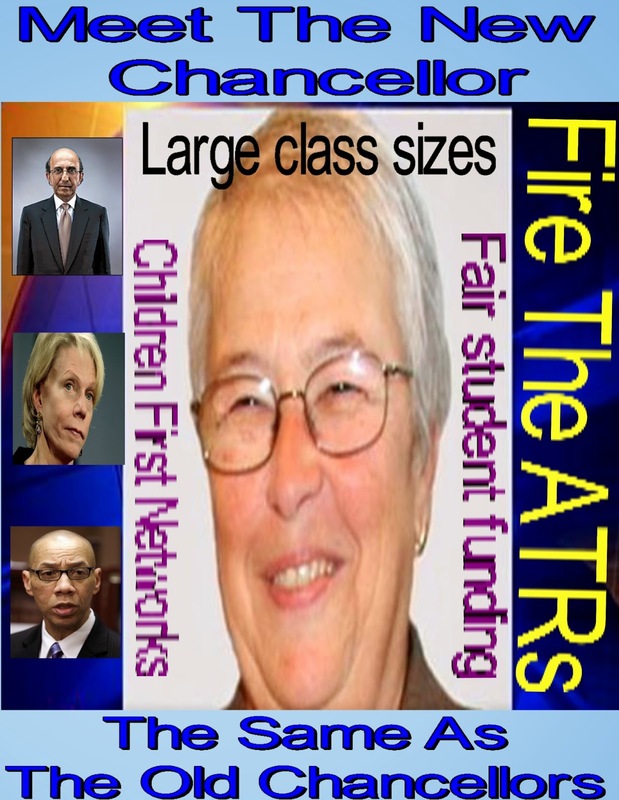 The few cosmetic changes that Chancellor Carmen Farina has made such as a more stringent qualification process to become a Principal through the Leadership Academy and more parent involvement pales in comparison to the more major flaws in the DOE like making the classroom environment less hostile, a reduction in the amount of paperwork, and the apparent continuation of the useless, money-sucking "Children First Networks" that dictate to principals who to hire (the cheapest and untenured teachers) and push unneeded and useless programs that doesn't work in the classroom. We may have a new progressive Mayor and a long-term educator as a Chancellor but when it comes to the conditions experienced by teachers in the trenches that has made the classroom a hostile environment, the DOE policies have remained unchanged as its the DOE policy bureaucrats first and the NYC public school students last. Memo To The Chancellor, Why Fair Student Funding Is Bad For Student Academic Achievement. One of the more despicable education policies under the Bloomberg Administration was the introduction of the "fair student funding" (fsf) formula for the NYC public schools. 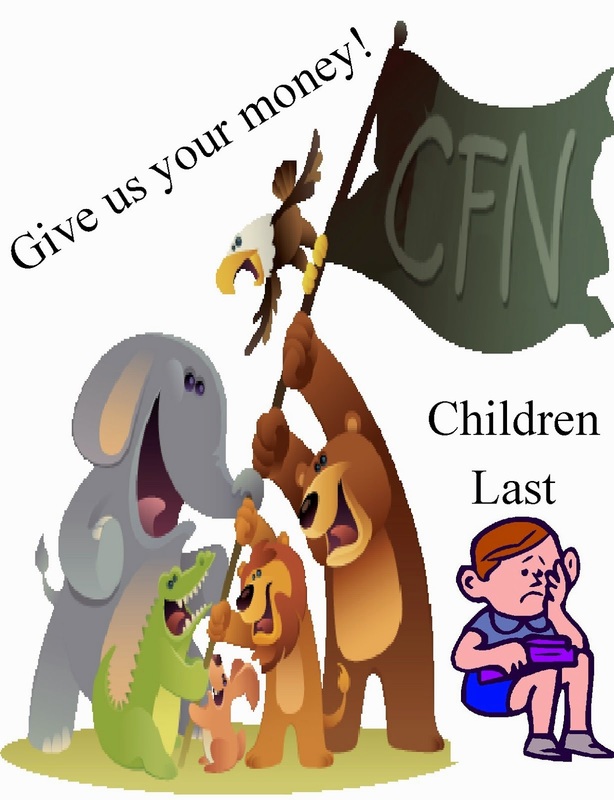 The "fsf" forced principals to consider their tight budgets when hiring staff and the student's academic needs became secondary to the school budget. For decades the school staff salaries were paid by DOE Central, which was based upon the student population at the school and were given a set number of staff members. When it came to teachers, the schools did not have to take salary into consideration and many principals would hire highly experienced educators for their schools. However, after the infamous 2005 contract, the school funding formula was changed and the DOE decided to empower the schools by giving the principals control of their budget. Unfortunately, the majority of schools have found themselves funding programs and consultants out of their own budget as the average school budget shrank by 14% over the last seven years. A bad bargain indeed.The worst was the "fsf" which forced schools to hire the "cheapest" and not the "best teachers" for their students. Additionally, principals had to pay for services that were once paid for by DOE Central and another significant chunk of money was used to pay for the useless and money-sucking "Children First Network" that the school was forced to join with. The ""fsf" policies added to the closing down of 163 schools under Michael Bloomberg's tenure has resulted in a 2,000+ ATR pool, primarily composed of older and highly experienced quality teachers.that principals couldn't or wouldn't hire Therefore, the influx of inexpensive "newbie" teachers, some not even certified to teach in the classroom and the "Leadership Academy " principals the run the schools is simply a recipe for failure and shows up in the poor student academic achievement scores over the last half of a decade. Moreover, the income/racial/ academic achievement gap has actually widened which shows the failure of using the "fsf". Eliminate the "fair student funding" policy. Clean house at Tweed and the DOE. Reduce class sizes, the largest in the State. No more "sixth periods" to encourage teacher hiring. Remove principals that can't or won't collaborate with staff. Stop using uncertified teachers who teach out of license. 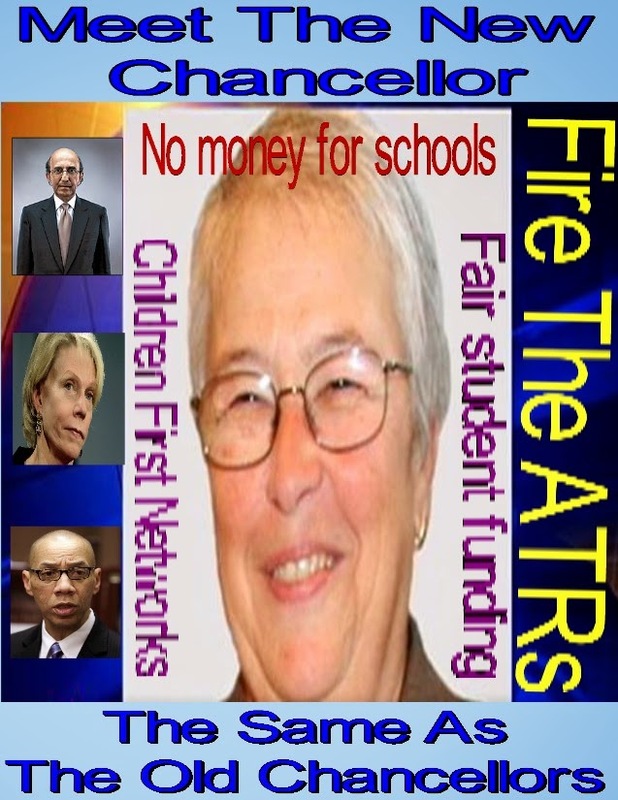 If the NYC schools are to see real student academic achievement and start to reduce the already too wide income/racial achievement gap, the Chancellor must eliminate the "fsf" and require principals to hire from the ATR pool for those quality teachers that their schools lack. So far Chancellor Carmen Farina's tenure has been, to say the least, very disappointing as she is more of the problem and not the solution when it comes to improving the schools. My Interview With A Uniformed Union Official About The Proposed Teacher Contract. I spoke with a union official from one of the uniformed services and asked him what was his opinion about the proposed teachers contract with the City? Predictably, he was not too happy with the terms of the contract and believes the City got off lucky in getting the teachers union to agree to the contract out to 2018. He started off by blaming the contract woes on Mayor Bloomberg and his refusal to give the teachers union the "City pattern" that almost all other unions received back in 2009-10. Moreover, he told me the Mayor deliberately defunded the Labor Reserve Fund to make sure the new Mayor could not use any money from the fund for retroactive raises. The union official also brought out the over the years when the Mayor claimed the City was running a deficit. Magically, by the time the budget was passed, there was a surplus. Of course, Mayor Bloomberg used the City's surplus to spent billions of dollars for high priced consultants and programs that never seemed to benefit the public. Even now this uniformed union official was told by many financial people that the City has large hidden surpluses and that their statements that the City doesn't have the money for significant raises as well as retroactivity rings hollow. He belittled Michael Mulgrew's statement that the City doesn't have the money for everything. He believes that the proposed teachers contract is inadequate and unacceptable to the uniformed unions of New York City. The very idea of receiving 10% for seven years (1.43% annually) is insulting. This union official believes the arbitrators would have awarded the teachers union their two 4% raises and the retroactivity that goes with it. Especially, since the City's economy has improved markedly over the last few years. Finally, none of the uniformed unions will accept "zeros" as the UFT did in the two year 2011-12 period. Instead, it will be more like the TWU contract that has at least a 1% raise annually from 2012 and with full retroactivity. He was very dismissive of the teachers union acceptance of the reduced rights for the ATRs. He said a union should never have different rules for the same job title. Its not good for union solidarity in the long term. According to him, there is no similar two-tiered system in any of the Municipal unions that is being accepted by the UFT. He understands that the retroactive pay was the major reason for the union to agree to the inadequate raises and the deferrals. However, he doesn't understand how the union could agree to allowing the City not to pay members who worked in the 2009-10 school year their retroactive pay if they resign, get terminated, or die in service? He thinks that's terrible and that somebody will be filling a lawsuit to get that money they earned. Interestingly, the news media supported the proposed contract but of late has changed their minds. This union official believes that its simply a ploy to have the other unions agree to this contract as a "City pattern". This uniformed union official said that the proposed teachers contract will not be the new "City pattern" and that the raises will reflect the improved economic condition of the City which can support more substantial raises and full retroactivity. 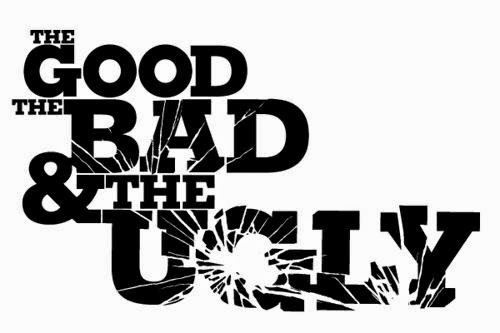 The Good, The Bad, And The Ugly Of The Proposed Contract. It's no secret that many of the members are dissatisfied with the proposed UFT contract with the City but should they vote for it next week? Of course my answer is NO! However, lets look at the various aspects of the contract. The contract eventually gives us the retroactive pay for the 2009-10 years when Michael Bloomberg failed to follow the "City pattern". The money owed to its members is significant. For recent retirees and members who retires before June 30, 2014 will get all their retroactive pay in one lump sum and have their pensions adjusted for the retroactive raises. All per session and coverage pay will be adjusted as well for the last two years. All the retroactive raises are deferred and payments will start only in May of 2015 and end in October 2020. Moreover, the two 4% raises that the union claims they are receiving is really two 3% raises. See Steve Hiller's analysis. Additionally, the loan that we gave the City in not getting the "City pattern" does not include any interest as previously was done. Further, the union agreed to a "0 raise" for eighteen months and a toatl raise less than the inflation rate. Moreover, the per session pay is only paid for the last two years. Finally, the teacher evaluation system that requires termination for two "ineffective ratings" remain unchanged as well as no commitment to reduce class sizes. Where do I start? First, the UFT has agreed to a member "caste system" with diminished due process rights for ATRs and no "mutual consent". Worse, are the 25% of the ATRs who were charged under 3020-a and found innocent of these termination charges. 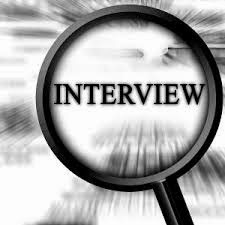 The DOE has decided that they don't have to offer these "untouchables" an interview of "provisional appointment". Shockingly, the union actually approved this attempt to punish the ATRs again. Second, teachers who resign or are terminated will not get the retroactive raises or payments even when they worked in those years. Finally, there is no change in the "fair student funding" that has resulted in principals hiring the "cheapest" and not the "best teachers" for their students. To see the table, click the table picture and use view to make it even larger. Vote No On Monday For Our Self Respect. The UFT members in the schools will be voting yes or no for the proposed contract. 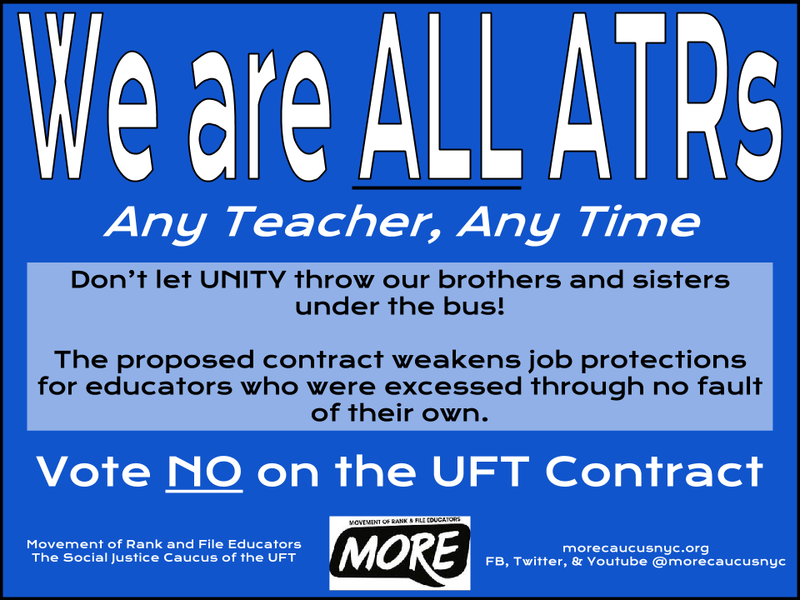 By voting no you will be telling the UFT leadership that we refuse to throw the "ATRs under the bus", allowing for a DOE imposed "caste system", a miniscule raise that is less than the inflation rate, deferred payments as far away as 2020, and a new "City pattern" that has made the other unions angry at us. Did the DOE commit to reduce class size? No! Did they eliminate the "fair student funding" ? No! Has the DOE agreed to reduce the amount of observations? No! Has there really been a change of tone at the DOE? No! The answer to all these questions is no! Please read the following blogs and see why this contract is dangerous for our members to approve. Can Retiring ATRs Get Both The Lump Sum Retroactivity And Severance? - No! 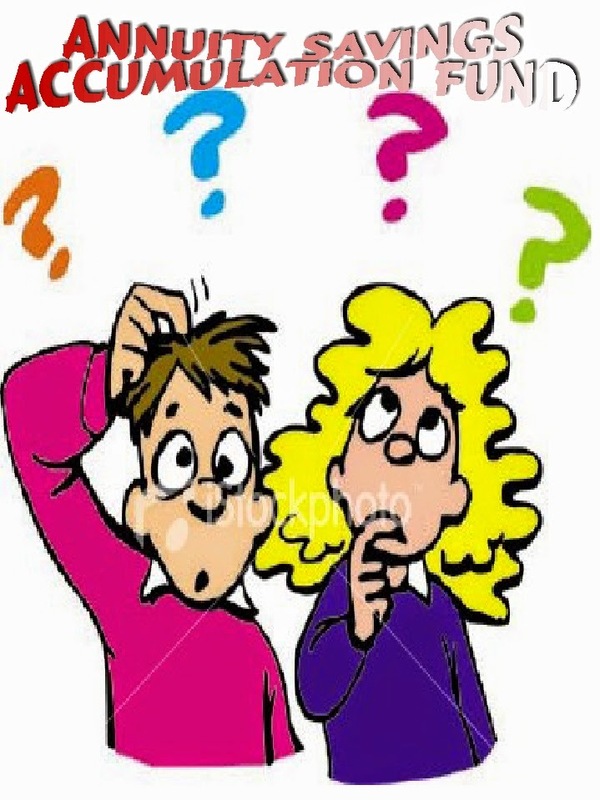 I was asked a question from an ATR who plans to retire at the end of the school year could he get both the lump sum retroactive raises along with the immediate pension boost by retiring before June 30th, 2014 and the severance package? The answer is no! He can either take the ATR severance package and retire in July or take the lump sum retroactivity by retiring by June 30th, but he can't have both. The reason he can't take both options is that the MOA states that for ATRs a severance package (20% of a person's salary) is only available between 30 and 60 days after the contract is ratified by the members. The earliest the contract can be ratified is June 3, 2014. Therefore, the first day the severance can be offered is July 3rd, 2014. Consequently, if the ATR waited to take the severance package, he would then get the retroactive raises and the pension enhancements at the same time as active in-service members. The question then becomes which option should he take? The severance package and retire in July or the lump sum retroactive raises and pension boost and retire by June 30th? The answer depended on that individual's situation and the tax considerations. However, it does seem to me that taking the severance and retiring in July is the preferred approach since the ATR retiree will eventually get his retroactive raises and pension enhancements, while getting an up to an extra $20,000 severance as well. Moreover, by retiring in July, he is covered for August by his health insurance and wouldn't have to pay $110 a month for retiree health insurance. Finally, his tax situation for this year would eat up some of his retroactive pay because of the large lump sum payment. Another point to consider, by taking the severance package, the ATR retiree can look forward to having annual raises in his pension and additional paychecks in the first five years of retirement when his pension is not eligible for a cost of living adjustment. That's a nice little present going forward. While this may not be the proper choice for everybody, it would appear to be the choice I would make given my present circumstances. The DOE Continues To Punish ATRs Who Won Their 3020-a Hearings And That's Unfair. One of the most disturbing part of the proposed UFT/DOE contract is the "caste system" that is being established by the DOE for the ATRs with diminished "due process rights" , lack of a "mutual consent" requirement, and worst of all the punishing of ATRs who won their 3020-a termination hearings and that's unfair. According to the Memorandum of Agreement (MOA) the union has agreed to allow the DOE to continue to punish those ATRs who won their 3020-a termination hearings by agreeing that the DOE did not have to offer these ATRs an interview or a "provisional placement", no matter how long ago their 3020-a hearings happened. 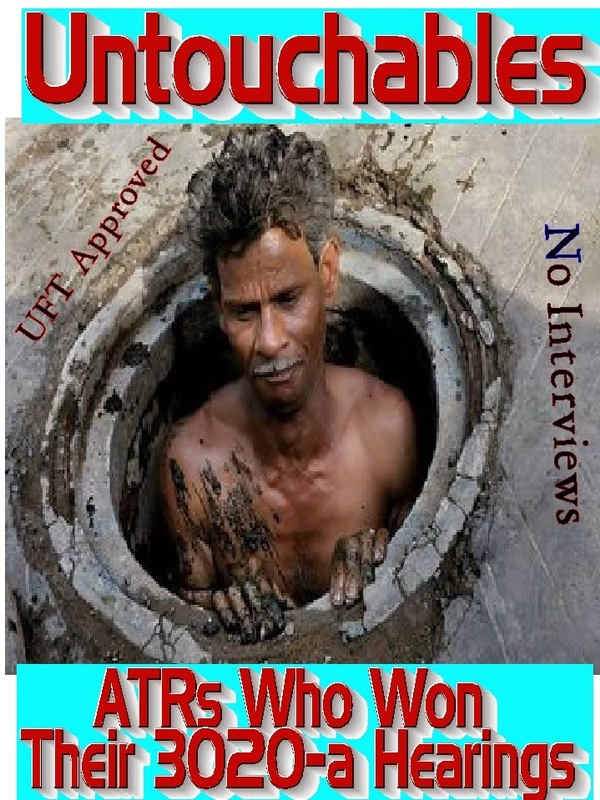 These ATRs who survived their discipline process are now known as the "untouchables" and are being placed in a separate, or lowest category of the union approved DOE "caste system". Approximately 25% of the ATRs are now classified as "untouchable" and they include any member that received a fine of $2,000 or more, a 30 day suspension or longer, and who agreed to a stipulation. Moreover, there is no time limit, looking back. That means that a member who won their 3020-a termination hearing in the last century could be included as an "untouchable". The lowest DOE caste. These "untouchables" include many quality educators who did nothing more than being targeted by a vindictive or biased Principal, or challenged an administrator about violating their or their students rights (IEP for one) that resulted in the bogus or frivolous 3020-a charges. Because of how the New York City 3020-a arbitration works, the arbitrator usually gives something to the DOE and a $2,000 award is simply a slap on the wrist. Therefore, almost all teachers who went through the 3020-a process is included in the lowest DOE caste, the "untouchables". Therefore, no matter how long ago an educator was subject to the 3020-a process and no matter how many satisfactory observations and ratings they received since, they are now "untouchable" according to the DOE. How can our union have agreed to this travesty of justice in allowing the DOE to punish the ATRs who won their 3020-a termination hearings by placing them in the lowest caste and treating them as "untouchables". Shame on the DOE who developed this "caste system", shame on the union leadership who agreed to it, and shame on the members who vote yes for this unjust contract that treats its members differently. According To One Math Teacher We Are Not Getting Our Full Retroactive Raises. One of the major selling points of the proposed contract is that we are getting the "full retroactive raises" despite the length of years to actually receive it. In a contract that is giving its members a 1.43% annual raise for the seven years, less than the 2.2% inflation rate for the last three years. Failure to give us the 11.3% raise in our upcoming September checks (instead its 2.1%). A " zero raise" for eighteen months with most of these raises and "retroactive raises" deferred and back-loaded to the end of the contract and "throwing the ATRs under the bus". It now appears we are being shortchanged on our "retroactive pay". 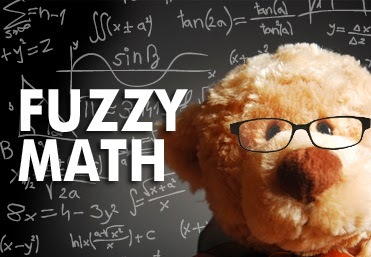 Esteemed high school Math teacher Steve Hiller of the Bronx has taken the time to fully analyze the math involved and believes the City and the UFT used some questionable accounting tricks to claim the teachers will be made whole by October 2020. Without going into detail here is the email Mr. Hiller sent me. Decide for yourself. The following is a brief examination of the math behind the deferred payments in the proposed contract. 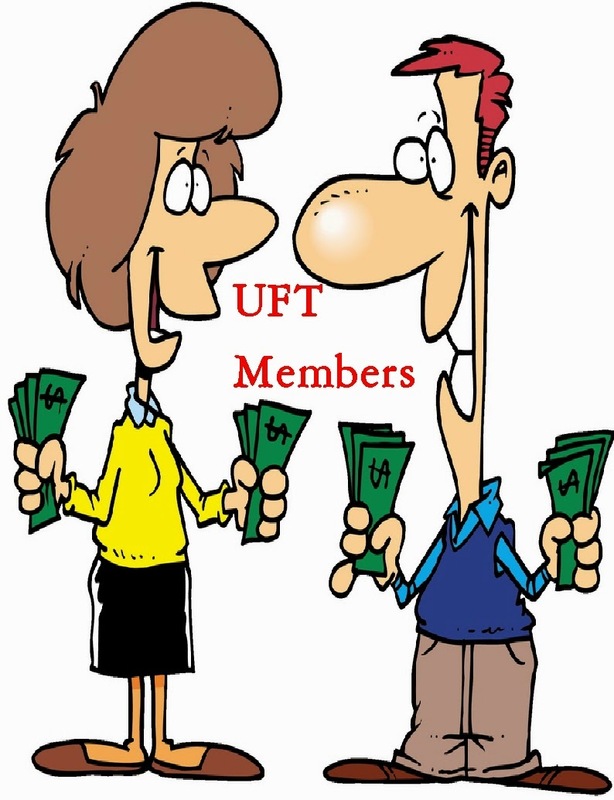 The claim made on numerous occasions by Mulgrew that UFT members will receive “100 percent of the money they are entitled to, back to Nov. 1, 2009, by 2020” is at best a reductionist simplification of the true nature of the payments, and at worst a willful attempt at manipulation of the membership. New York City is the financial capital of the world. It is simply impossible to accept that the framers of this contract simply forgot about the role of compound interest when payments are deferred over time. I must admit up front that I am by no means an accountant, and have little knowledge of the formulas used in that world. I have approached this problem purely mathematically, and it is conceivable that I have neglected some factor. That said, given the elegance of the result, both intuition and experience tell me that this is highly likely to be the correct solution. If anyone has the relevant financial knowledge, I would love to hear from you. The interest calculations here are complex. On the one hand, the city is apportioning raises in a piecemeal fashion over many years. Each of these individual amounts grow for different lengths of time. On the other, the city is making several discrete payments to us at many different points in time, each decreasing the total amount that will grow with interest. To the extent of my understanding of the contract, the equation below tells the value of the aggregate monies owed to us in 2020 if they were invested at a rate r from the time they were earned (where an interest rate of 4% corresponds to r = 1.04). Below in the table on the left you will find the 2020 value of the retroactive payments at top salary compounded for various interest rates. Note the 0% rate is what the contract proposes. (For the life of me I cannot figure out why the UFT claims the total payments for top salary is $54,000 – even at 0% interest, my current understanding of the contract insists that this should be $56,000.) To find your loss from not getting any interest, pick a percentage rate and subtract $54,000 from the value. The table on the right is the big takeaway. It shows how many months at your current salary the contract is deficient for various interest rates. This table should be roughly independent of what that salary actually is. This can be viewed as how many months the contract expects you to work for free. Again, this is a very complex problem and I am not an accountant. But it is clear to me that very pertinent information has been withheld from the discourse, and this is something that both the city and the UFT are almost certainly aware of. I speculate that this was a way to claim we are being given the 4% + 4% as per pattern bargaining, without having to actually pay it to us. To wit, if we were instead given 3% + 3% with five and a half percent interest, we would be receiving almost identical payouts. As someone who knows the math, I will say that this very much feels like an attempt to manipulate those who do not, and this intellectual dishonesty rankles me considerably. I fear that many UFT members are unaware of the implications of the proposed 0% compounded interest, and my hope is to ensure that you have all relevant information before you cast your vote. If you would like to know the derivation of the equation I have used, feel free to contact me. tl;dr – contract not as sweet as purported, and wasn’t all that sweet to begin with. 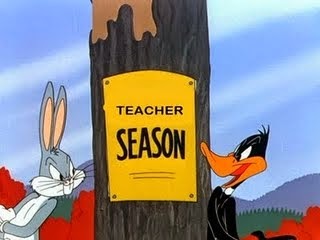 The Union Agrees To A Teacher Caste System. How Do The Raises Work In The New Contract? Our Union Stabbed The ATRs In The Back.